“We are not supposed to know what happens in the future,” states the first character you encounter in Year Walk, an iOS game released last month that pushes the boundaries of what experiences can be created through mobile gaming. More than just a series of puzzles or point-and-click game, Year Walk merges myths of Swedish folklore, setting you on a “year walk,” which is a tradition of going out on one’s own at midnight at the end of the year to glimpse into the future. The game itself is beautiful, appearing like layered paper art in washed out tones, but it’s the experience of unsettling, escalating horror that involves sound, confusion, and surreal moments that builds it all into something that’s different from other games out there. 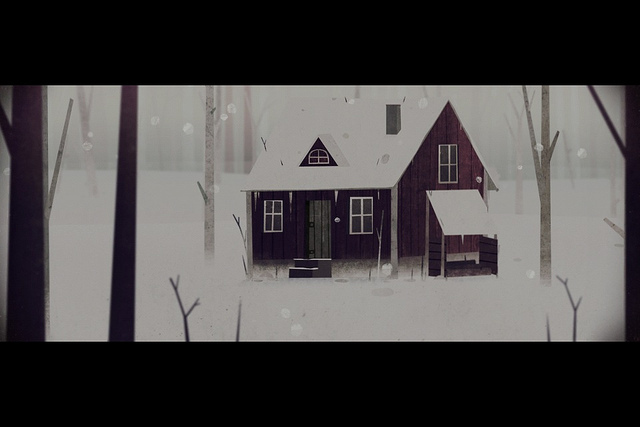 Most games currently available for the iPhone and iPad are whimsical puzzlers, with some exceptions like Slender Rising that involves the really terrifying meme the Slender Man, and old haunting favorites like Silent Hill, but Year Walk is the first to be a more uncanny horror and really use its art as part of its atmosphere. Year Walk was created by Sweden-based Simogo, a collaboration between Simon Flesser who does the art and design and Gordon Gardebäck who does the coding, but it’s totally different from the playful, colorful, fit-for-all-ages games they’ve done before. You definitely do not want your kid to play Year Walk, where the first of the (often frustrating) puzzles you have to solve involves a wooden doll with a blood-splattered face hanging from its neck in a shed. It all gets creepier from there. On the Simogo blog, you can see the early illustrations for Year Walk, where they explain how they were influenced by German Expressionism and then flatted it out. 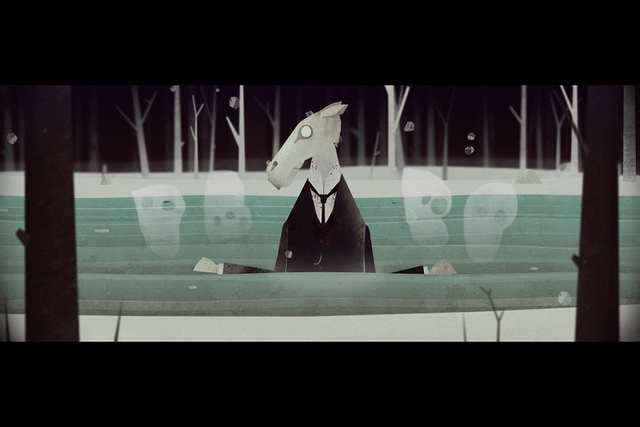 There’s also the heavy influence of Swedish folklore, such as with the horse-headed man you encounter in a river who is based on the “Brook Horse,” a white horse that would appear in a river, and anyone who harnessed it would not be able to get off again and the horse would jump in the water, drowning the rider. As already stated, not for kids. All of these details are explained in an accompanying Year Walk Companion app, but you can delve into the world of the game that centers on a vague love story without context and still be haunted by the crunch of snow under your character’s feet punctuated by muffled sounds coming from somewhere in the snowy wilderness. 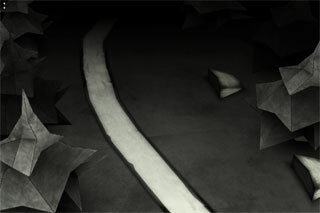 This is also a mobile game that’s best when not mobile, oddly. Find a dark room, preferably with snow falling outside, maybe you can fly to Sweden. 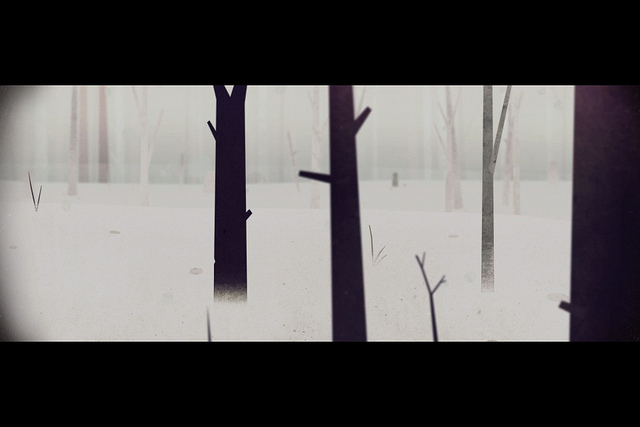 Then plug in your headphones and go out into the disorienting forest, and immerse yourself in the eerie setting that really uses that intimate nature of the iPhone to be less a game than a scary, atmospheric exploration in disjointed storytelling.